Welcome to Maryhill, a part of Glasgow often overlooked on the standard tourist trails, something which this walking guide aims to help change! Sandwiched between the peaceful, sunken green corridor of the valley of the river Kelvin, and some stunning city views from the raised portions of the Forth & Clyde Canal, municipal Maryhill features a surprising amount of historic buildings, interesting architecture and important social and industrial heritage. The walk is a circular route, and can take around two hours at a reasonable pace although there are also shorter versions that take around 60 or 90 minutes respectively. By Car: the postcode for the Maryhill Burgh Halls is G20 8YE. Gairbraid Avenue is closed to traffic, so turn off Maryhill Road at Kelvindale Road, then turn right up Burnhouse Street, and you will find Gairbraid Avenue on the right. On street parking is usually available in the vicinity. By Bus: Maryhill Road is well served by buses to and from the city centre; alight outside Maryhill Library, directly opposite the Burgh Halls. From town, services 40, 61, and 119 pass the Halls. From Byres Road or Hillhead Subway station, look for a northbound 23 bus (Summerston). See www.travelinescotland.com for more details and times. By Train: The nearest mainline station is Maryhill, situated about 20 minutes walk (1km, 0.6 miles) north of the start point, straight along Maryhill Road. For more details, see www.scotrail.co.uk. Hillhead and St Georges Cross Subway stations are also about 20 minutes walk to the south. By Bike: The canal forms part of National Cycle Route 754; more info at www.sustrans.org. Bike racks can be found nearby on Maryhill Road and within the courtyard behind the Fire Station Gates. It was the coming of the canal in 1790 which led to the foundation of Maryhill as a township in its own right. When the owners of the Gairbraid estate, Mary Hill and her husband Robert Graham, sold the first land in January 1791, they stated that “the feuer is required to make the road or street through the town of Mary’s Hill from the toll road towards the Water of Kelvin”. The family gravestone featuring Mary Hill’s name can still be seen today in the churchyard at Glasgow Cathedral. Maryhill, known earlier by the name Kelvindock or Drydock became an independent police burgh in 1856. The centre of Maryhill was once further north from here, by Maryhill Cross  but with the opening of the new Burgh Halls, what was considered Maryhill was gradually moving further south. The Burgh Halls and adjoining police station opened on April 26th, 1878, and were designed by the architect Duncan McNaughtan. In the building were twenty stained glass panels, designed by Stephen Adam, depicting the varied trades and occupations of the area, at the time. This walk will highlight a number of the buildings and scenes depicted in the panels. The main Hall sat over 900 people, and ran lengthwise along Maryhill Road. To the left on Gairbraid Avenue, the lower building formed the Police Station, including “15 cells, four of which have been specially designed for the accommodation of drunks”. Derelict for many years, the Halls have recently been the focus of a major multimillion pound fundraising campaign to re-open them to the public as a community hall, cafe, nursery, recording studios and offices to let, all entered through the Fire Station courtyard. Head along Gairbraid Avenue away from Maryhill Road. Behind the four sandstone archways lies the entrance courtyard for the Maryhill Leisure Centre, as well as the restored Maryhill Burgh Halls complex. The courtyard is the site of the former Maryhill Fire Station, constructed in 1892, by City Engineer A.B. McDonald. The stunning metal gates, showing firemen in period dress and equipment, are designed by sculptor Andy Scott, and fill the four archways that fire engines once drove through. Until the late 1960s, a 3-storey tenement stood above, in which the firemen lived. The Baths and Washhouses were opened in 1898, after the Burgh of Maryhill had become part of the city of Glasgow. The city’s Coat of Arms can be seen over the old entrance just round the corner in Burnhouse Street. A description when it opened stated that the pool was 75ft by 35ft, and that “there will be 6 hot baths for women, a private wash-house, and 35 washing stalls with drying stoves.” Today, the building is thriving again as a busy swimming pool, leisure & fitness centre. The whole series of buildings from the Burgh Halls to the Baths are all now listed buildings, recognising their historical and architectural importance. Carry on along Gairbraid Avenue, then take the second left down Balfour Street. The empty island of land surrounded by Burnhouse Street, Gairbraid Avenue, Balfour Street and Kelvindale Road once held the Gairbraid Public School. It was built for the Maryhill School Board in 1898, and demolished a few years ago after a fire. At the bottom of the hill, turn right onto Kelvindale Road. We will pass the main entrance to the Barracks later . Up to to the right, at the end of what’s now Kelvindale Gardens, once sat one of the largest and grandest houses in the area Gairbraid House. Dating from 1688, it was rebuilt in 1789, and demolished in the 1920s. The driveway to the house, once lined with trees, became the route of Gairbraid Avenue. Just after passing St Gregory’s RC Church (1971, by Cordiner, Cunningham & Partners) on the right, and just before the road crosses over the Kelvin, turn right off the street onto the tarmac path leading down into the trees part of the Kelvin Walkway. Directly across the river was the enormous Kelvindale Paper works, which started life as the Balgray mill in the 18th century. The factory itself closed in the 1970s, and the site was developed for housing, which can be glimpsed through the trees. A few of the company houses survive on the opposite bank, and as we carry on up-river, we’ll shortly pass a dramatic V-shaped weir across the river that fed the mill lade for the factory. 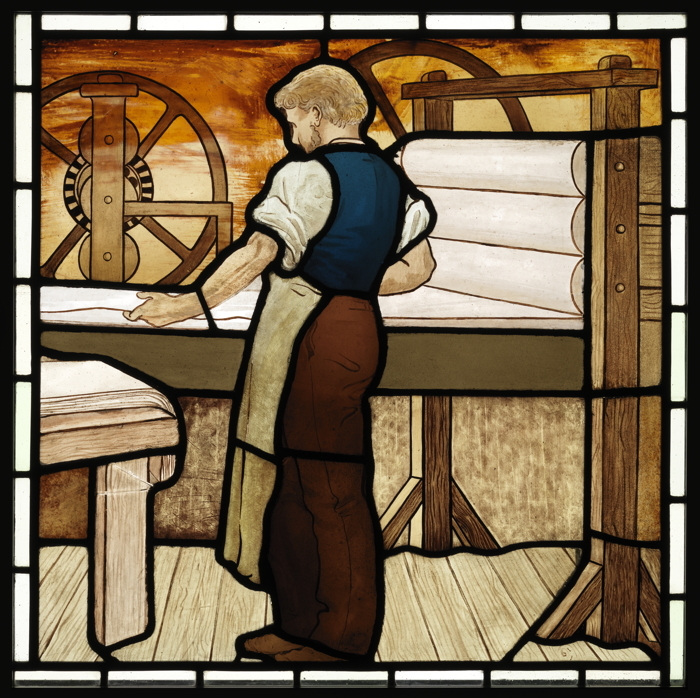 One of the stained glass panels made for the Burgh Halls featured a Papermaker, working in one of the two paper companies that were manufacturing in the area at the time. Ignoring the first path on the right, take the fork down to the left, along the river past the weir. This section of the Kelvin Walkway follows the route of the former Glasgow Central railway line (to the south it ran under the Botanic Gardens and Great Western Road, emerging at Kelvinbridge). The evidence of the many railway lines that criss-crossed the area are shown by the number of abandoned bridge piers standing in the river, now often providing an excellent perch for a heron or other wildlife, but once serving the many factories and industries that used the Kelvin for water or for power. Don’t go under the aqueduct, instead rejoin the tarmac path to the right, heading up the steep zig-zag slope, signposted as taking you up to the Forth & Clyde canal. On the canal, turn to the left, and walk out onto to the middle of the aqueduct there are great views looking back down the Kelvin valley where we’ve just come from. The aqueduct you’re standing on is a scheduled ancient monument, and at 400 feet long, and 70 feet high, when it opened in 1790 was one of the largest to be built since Roman times. The engineer in charge was Robert Whitworth, and the cost of the construction, at £8,500, almost bankrupted the canal company. On completion it became a tourist attraction, drawing admirers from far and wide. The aqueduct was so important to Maryhill that it featured on the Burgh Seal with a steamboat passing over it, and symbols of the industries of the town below. Don’t go any further across historically the Kelvin was the traditional boundary of Maryhill, so if you follow it any further across the river, you’ll go outside the scope of this guide! Instead, go back the way you came, but instead of going back down to the river, carry on following the canal towpath up and to the right as it runs past the series of locks and basins. Opening off one of the basins near the top of the series of locks is an old dry dock, known as Kelvin Dock. This, and the land to the left of it, (now with some picnic tables and making a good spot to have some lunch), was actually built as a repair facility for the canal in the 1790s. It later developed as a boat building yard owned by Swan & Co. from 1842, and lasted until 1949. The boatyard built a variety of ships including the first puffers, and other prefabricated ships. Some of these were launched sideways into the canal. A boatbuilder features in one of the stained glass panels and the boat shown there features a swan on the side. David Swan was Maryhill’s first Provost in 1856, and initially lived in a mansion called Collina, on the hill overlooking the canal, near the high flats. Just beyond the dock, where the traffic junction is, was the original Maryhill Cross. The tenements that stood here were demolished in the 1960s. Behind it and down to the left was the Dalsholm printfield, whose female workers wearing clogs and standing on duckboards because of all the water sloshing about are featured in one of the stained glass panels. The area is known as the Butney, assumed by many to be a reference to Botany Bay, but more likely deriving from the historic connection to the former printworks nearby. Just past the footbridge over the canal at the top of the locks, is a long, low whitepainted building, known as the White House. Built around 1810 by John Walker as a pub, it was later Maryhill’s first post office, and then a long line of different pubs. To the left, the modern bungalow is on the site of a house where the tenant was required to have ale available at any time of day or night for the canal workers. Continue following the canal towpath along to the point where it crosses over Maryhill Road. The exit to the top of Burnhouse Street is just before this on the right and provides a good stopping point for the shorter version of the walk, bringing you back out past the United Presbyterian Church of 1859, later Gairbraid Church, by the Baths & Wash-houses (4) Otherwise, continue following the towpath. From the bridge over Maryhill Road, to the south, a good view of the back of the Burgh Halls can be seen. In the distance, the flagpole marks the viewpoint at Ruchill Park. Across the canal to the left, the prominent tower is that of Maryhill High, originally the Free Church. Now converted to flats, this spire features in the Canal Boatman stained glass panel. Following the canal path around the bend, and just visible is the back of a brick industrial building originally the Kelvin Foundry of 1837, then the Clarkson Brothers Maryhill Engine Works from 1873. This was immortalised in one of the stained glass panels it’s likely that the bearded gentleman with the paper is either John or James Clarkson. This building is one of few to still exist from when the panels were made in 1878, and remarkably is still in use as an engineering works today. A few minutes walk further round the canal is Stockingfield Junction. If you were to follow the canal branch across to the left for a few miles, you’d reach the recently restored Lambhill Stables www.lambhillstables.co.uk, then Falkirk and, eventually, the River Forth. We’re following the right branch, towards Port Dundas basin in the centre of Glasgow. Just visible along the Falkirk branch is the remains of a stop lock constructed during World War II to help prevent too much water being lost and pouring down into the town in the event of the canal being hit by enemy bombs. To exit early here take the path on the right just past the junction onto Lochburn Avenue, and follow the road back down to Maryhill Road, and the start point of the walk. Otherwise, continue following the towpath. There were a number of iron works in the area: the Ruchill Iron Works, the Maryhill Iron Works (which stood where the modern industrial buildings on the right hand side are), and the famous Shaw & McInnes works near Firhill, which was still in operation until 2001. 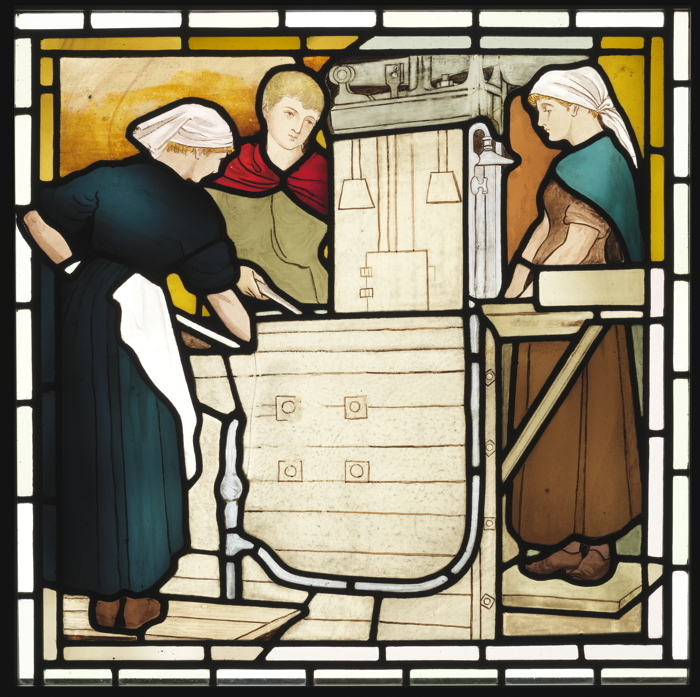 The importance of this industry to the area is shown by one of the stained glass panels featuring iron moulders at work. Also hidden amongst the buildings on the right is the Maryhill FC stadium one of the oldest junior clubs in Glasgow, dating back to 1884. Carry on along the canal towpath. Look over the wall to your right to see a canal spillway to help let excess water run off and maintain the level of the canal. A small overgrown inlet on the far bank of the canal here is all that’s left of what once formed a much larger basin serving the Ruchill Saw Mills another type of industry once common in the area, with the large basin on the canal at Firhill also being used in similar way. A sawyer features on one of the most striking stained glass panels with the whirring blade of a saw very close to his bare hands! On the left, behind the building with the faded mural celebrating the areas connection to the canal, was the Bryant & May match factory, producer of the famous Bluebell matches until 1981. In the foreground, and across the bridge ahead was Alexander Fergusson’s Lead and Colour Works. On the near bank was the site of the former Kelvin Chemical works it’s possible it’s one of these companies that was featured in Adam’s Chemical Workers panel. The bridge that takes the road over the canal is a modern replacement for a bascule bridge a narrow structure that could be raised and lowered to allow canal traffic to pass which was replaced as part of the canal Millennium works. Carry on under the bridge, and then leave the canal by the footpath immediately to the right, coming out behind Ruchill Parish Church. To the left can be seen the modern buildings forming East Park School, and beyond, the sandstone building with a tower that was its original home. As of 1895, there were three schools in the area: Maryhill Public School, Church Street Public School, and East Park Public School. More recently, Roy Rogers & his horse Trigger visited East Park in February 1954. One of the stained glass panels features a teacher and some of the children in his class. Head down Shakespeare Street past the Ruchill Church. The low building just past the red sand-stone church is one of the more famous buildings in the area a church hall, designed by Charles Rennie Mackintosh. The Hall dates from 1899 pre-dating the church next to it and the tea-room here (open Mon-Fri, 11am-3pm) makes a great place to stop for a break and a look around the interior, little changed from when it first opened, complete with original and detailed doors, folding partitions and decorative roof trusses. Carry on down Shakespeare Street to where it meets Maryhill Road at the Viking Bar. Turn right, and head up Maryhill Road. The red sandstone building just after Ruchill Street is another of Maryhill’s listed buildings. Built in stages between 1892 and 1899 as the Glasgow Soldier’s Home (hence the GSH lettering above the main entrance), by Mrs Alice Osborne as part of the Mission to Garrisons it had a tea room and quiet room, and was designed to help soldiers avoid the temptations of alcohol. It later became Maryhill Trades Union Centre, and ironically, it is now a pub. Directly across Maryhill Road from the Soldiers Home was the site of Maryhill Central Station and goods yard. This had opened as the Maryhill Barracks station in 1894; and closed to passenger traffic in 1964. Before then it was the site of Kelvinside Quarry, from where many of the stones on the Barracks wall were sourced. The supermarket and car park occupying the site now are actually built on stilts, above the cutting the railway lines ran in. Planning conditions for the site mean that these cuttings remain accessible to allow for the possibility for the railway line to be re-opened at some point in the future. Just past the supermarket, on the left, the familiar Barracks wall reappears, and is marked on the corner with a stone plaque explaining its history. The Barracks were a major feature of Maryhill from 1876; despite its closure and demolition in the early 1960s, the wall surrounding the Barracks remains, as does the gatehouse, just to the left of the main entrance, opposite the police station. The Soldiers stained glass panel shows two guards in the gatehouse: this is more famous in latter years as having held Rudolf Hess overnight after his flight to Scotland during WW2. From 1920, the Barracks were known as the home of the Highland Light Infantry a pub named after the HLI once stood nearby. The Wyndford housing estate on the site of the Barracks won a Saltire Society Award in 1968 for its design and layout, much of which was based on the street pattern of the barracks buildings it replaced. Continue heading up Maryhill Road. Where the modern police station now sits was once the site of the Castle Brewery, which had opened in October 1889, and had a capacity to produce over 30,000 barrels per annum. Before that the site was Robert Jeffrey’s Cotton Spinning Factory. On the left is the Elephant & Bugle pub, taking its name from the emblems on the HLI badge, and a long, low line of shops mark the site of what was once Maryhill’s grandest cinema the enormous Roxy. Named after the New York cinema that was the largest in the world, Maryhill’s Roxy opened in 1930, and originally sat over 2,200 people in both stalls and balcony seats. The steelwork for its construction came from just up the canal, at the nearby Lambhill Ironworks. The cinema closed and was demolished in 1962. Continue up Maryhill Road, near to the start of the walk, just past the junction with Lochburn Road, Maryhill Road and Gairbraid Avenue. Facing the side of the Burgh Hall is Maryhill Library, opened in 1905, and one of the libraries built thanks to the generosity of Andrew Carnegie. Now a listed building, the architect was James R Rhind, and in common with many of his library designs, there was a separate entrance for Boys and Girls to keep them out of the way of the adults! In contrast, the sculpture above the main entrance is a stunning piece depicting a woman and children reading together. The library features illustrated displays on the history of the area. Across the road, the tall windows give a glimpse into the restored interior of the main Burgh Hall itself. The small square windows are where the stained glass panels that have illustrated much of our route were designed to sit. That completes the Maryhill Walk - we hope you enjoyed it! This is just a taster of the history and heritage Maryhill has to offer there’s lots more to see and do. To find out more, visit the Maryhill Burgh Halls website or look out for other walking guides to the area. Maryhill Burgh Halls Trust runs free guided versions of this walk during the Summer months, and for groups all year round by arrangement. If you’ve done this walk, please let us know! Drop us an email at walks@mbht.org.uk or ring 0845 860 1878 all comments, suggestions, corrections, stories, memories or photographs are welcomed! Everyone who gets in touch to let us know what they thought of this walk will be entered into a regular prize draw to win some Maryhill stained glass window merchandise. Text by Gordon Barr, research and fact-checking courtesy of Ian R. Mitchell, William B. Black and Michael Meighan. Every effort has been made to make sure the information contained here is accurate and up-to-date at the time of going to press. No responsibility can be taken for any inaccuracies, errors or omissions, and anyone choosing to do this walk does so entirely at their own risk. We would be pleased to be informed of any corrections for a future edition.